Of the Conception: Immaculate, Immaculate? The Blessed Virgin is compelling to so many, in part, because of her very human role in the story of Jesus Christ. She is a figure of adoration that shares in the very human joys of birth, the challenges of obeying God’s will, and the agony of loss. The Magnificat, the Virgin’s Song, is the anthem of the Church. It is our song of hope that saves the spirit. It is our “yes” to the will of God that we will stand in the face of doubt, fear, and suffering to witness to the love of a living and present God. Our honoring of Mary carries with it the hope that all of the children of God will grow into a life of perfect freedom. In part, this begins at Baptism, the point at which we are “dead to sin” and born into new life and put on Christ through the same movement of the Spirit by which Mary became the ark of the New Covenant. We often hear the phrase “For God so loved the world that He gave his only begotten Son” and immediately think of the Crucifixion and the Atonement. When we hear those words we would do well to remember also the Nativity and the Incarnation. For God so loved the world that he gave his only begotten Son to be loved, cared for, and raised by his Blessed Mother. God does so love the world and that very fact is always held in tension with our own betrayal of that trust which leads us to Jesus begging his Father to “Forgive them.” We are always the beloved and forgiven of God and honoring the Blessed Mother gives us all a deeper sense of our own share in the love made known in the fullness of the Incarnation. I rather like the idea of the Immaculate Conception. Or, perhaps, it is simply the big brother in me that enjoys tweaking my colleagues as I sprinkle “immaculate,” “co-redemptrix,” and “assumption” through casual conversations! Call it theological shadenfreude. However, as much as I would enjoy being a fierce advocate for the Immaculate Conception of the Blessed Virgin, I wonder how celebrating such a feast impacts our understanding of her vital and unique role in salvation history? There is much confusion over the Feast of the Immaculate Conception. A common misperception is that the feast references the conception of Our Lord. There has been a conflation of the Virgin Birth with the Immaculate Conception. The Feast of the Immaculate Conception is a feast that celebrates the Conception of Mary as being one of a unique human unstained by the blemish of sin. Does believing that Our Lady is Full of Grace imply that we believe her to have been conceived without the burdens of human nature? What do we make of the difficulty of her choice to say “yes” to the indwelling of the Holy Ghost if she never could have said no? To say no would surely have been sin. Part of the compelling vision of Mary is her willingness to accept her unique role in history. If she were born without the ability to sin, it seems that she would have been unable to actually make a real choice – to say no (or yes for that matter) – and thus that pivotal answer to God becomes a fait accompli rather than a momentous, decisive choice made on behalf of humanity in the face of very human fears. Saint Thomas Aquinas rather vigorously argued against the Immaculate Conception. In his view, to say that any human’s birth was immaculate is to deny the saving work of Jesus Christ for all of humanity. In the Summa Theologica, Aquinas says, “Even in the Blessed Virgin, first was that which is natural, and afterwards that which is spiritual: for she was first conceived in the flesh, and afterwards sanctified in the spirit.” In other words, her conception was of a fully human nature with all that is inherited therein, and the fullness of her grace was a gift of the Spirit. The sanctification of the Blessed Virgin cannot be understood as having taken place before animation, for two reasons. First, because the sanctification of which we are speaking, is nothing but the cleansing from original sin: for sanctification is a “perfect cleansing,” as Dionysius says (Div. Nom. xii). Now sin cannot be taken away except by grace, the subject of which is the rational creature alone. Therefore before the infusion of the rational soul, the Blessed Virgin was not sanctified. To argue against the notion of an Immaculate Conception of Mary may seem to lessen her status yet, Aquinas writes, “…this (Immaculate Conception) appears to be part of the dignity of the Virgin Mother, yet it is somewhat derogatory to the dignity of Christ, without whose power no one had been freed from the first sentence of condemnation.” Our Lord’s saving work encompasses all of humanity, including his Blessed Mother. Her yes to that work cannot have been an act of foreordained holiness but must have been a “yes” that had consequences, import, and full participation. The Incarnation is the unifying of the human and the divine by the miraculous working of the Holy in the body of humanity. From that union came the perfect expression of both humanity and divinity, Our Lord Jesus Christ. It seems that the Immaculate Conception, as a theological construct, makes the Incarnation less than the full union of humanity with divinity. It implies that this union was not the coming together of both humanity in its fullness and divinity in its fullness but was a union of divinity with an immaculate being that is something more than human and less than divine. …the Trinity is portrayed in this window is significant. Often, the Trinity is portrayed in a manner that might be called modalistic: each Person is characterized in a distinct manner suggestive of a special role: God the Father as a venerable patriarch on his throne, God the Son either crucified or in another manner suggesting his earthly incarnation, and God the Holy Spirit as a dove. 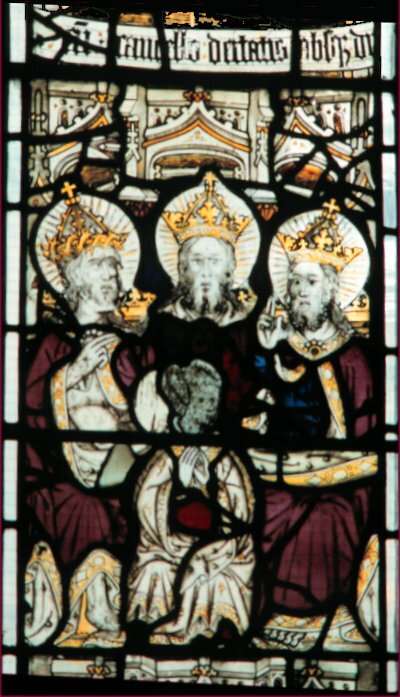 In this window, however, the three persons are depicted as virtually identical–the same faces, the same clothing, the same crowns, and all acting in concert. The message, of course, is that God is One, and that the three Persons of the Trinity are equal in every way, and both exist and act as One in everything. Furthermore, they are united in their focus on the person who kneels in their midst and who, as every medieval Christian understood, represents the entire human race. In fact, Mary is virtually surrounded and embraced–in this window she appears to be quite literally overshadowed–becoming a fourth person in the eternal relationship to which all people are invited. Mary is welcomed into this relationship with the Trinity on behalf of the whole of humanity. Her essential being is our essential being. If Mary is the prototypical human then an Immaculate Conception implies that her very essential humanity is not a full expression of our shared weakness and grace. It seems that to fully appreciate the great gift we have been given by grace requires a commensurate willingness to believe, in all of our hearts, that we have been given a gift of great price and worth as we too are embraced by the holy and overshadowed by grace that comes through the Son. That gift has been given not to immaculate souls and beings but to very human, real, and beloved human beings. Beings blessed to share in the grace offered to Our Lady. Thanks for this great posting! I sincerely feel that contemplation of Our Lady leads us towards a better understanding of our humanity and our life together as Church. Your writing helps us journey into that Discovery! Thanks again! At the heart of your argument seems to be one that I have heard many times: that the idea of the Immaculate Conception diminishes Mary’s “yes”. It makes it an inevitability that comes from a divine setup rather than a decision made by a mere human — one that we could ourselves emulate. But this assumes that grace and free will are incompatible (as Calvin or Pelagius would say). The Immaculate Conception is not about making it impossible for Mary to say “no”, but making it possible for her to say “yes”. God’s grace does not diminish our free will, but enables it — giving us the ability to freely choose God’s will despite the ways sin has limited our freedom. It is not about limiting our options to good choices, but expanding our options beyond the limited goods we choose in sin to the ultimate goods made available to us by God. Mary’s “yes” is the ultimate “yes” — the choice of God’s greatest good, which is the sharing in the divine life. And the ability to make that choice is exactly what sin inhibits and the grace of God enables. So, to say that Mary could make that choice without the saving Grace of God is to make her super-human, not the other way around — it is to ascribe to her the ability to make a choice without the saving grace of God that we ourselves cannot make without that grace. The Immaculate Conception, as I understand it, does not say that Mary is some unique being that is not in need of redemption. Rather, it is to say that Mary is redeemed right down to the very core of her being — that it does not stop short of the very roots of who she is (this, as I understand it, is how Dons Scotus answers Aquinas’ objections). In other words, Mary is as holy as a redeemed creature can be. By God’s grace she is able to bear Christ to the world. And this is what the doctrine of the Immaculate Conception reveals to us about the Gospel of Jesus Christ. For now we are redeemed sacramentally in Baptism. But on the day of our resurrection, our redemption will be complete, right down to the very core of our being — just like the Blessed Virgin. By the way, I owe a good deal of these insights to Herbert McCabe from his book “God Matters”, which I highly recommend to professional and armchair theologians alike. Thank you for this reflection on the Immaculate Conception, especially as I have been one of those you have tweaked. It happens to be one of those “dogma’s” that I grew up with but could never accept. It always seemed that this belief made Mother Mary less human, less amazing in accepting the message of the angel and reduced the whole Annunciation scene to an unnecesary afterthought! I agree with Fr. Vroon, and would add a further point, in contrast to Mother Camp: I find the argument that the Immaculate Conception makes Mary “less human, less amazing,” curious, because it seems to 1) implicitly assume that sin (original or otherwise) is the thing that makes us human! Also, it seems to assume that 2) God’s will and ours are in competition, such that to be fully human requires the choice between yes and no. Of course, #1 is silly: sin is the thing which makes us less than human, and which separates us from each other and with God. Mary’s cleansing in the Immaculate Conception really, makes her more fully human. It allows her to be more present to God’s grace, and to respond to it more fully and abruptly than us. In this sense, Mary is more free than we are, because she is free to say yes to God, who is our ultimate Good (or some such Augustinian logic).